It's a zergling from starcraft. I used some sort of hybrid style in between sc:bw and sc2. I also tried to make it look as vicious as possible. 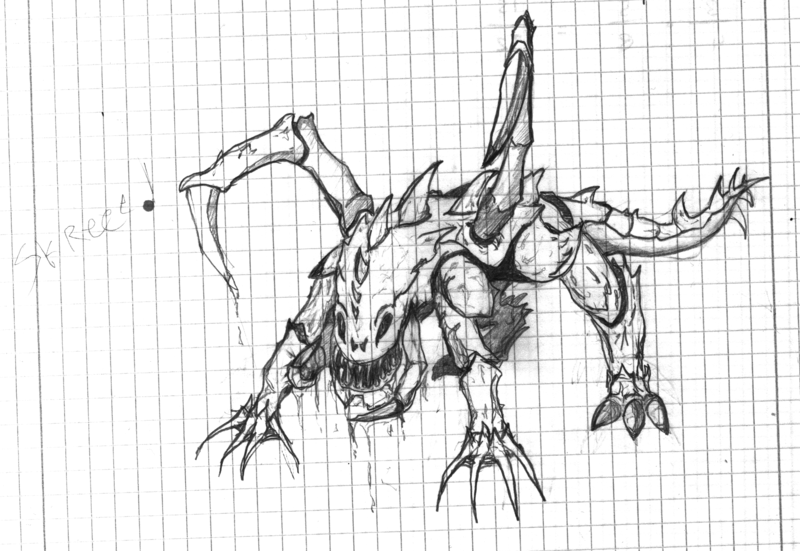 I didn't give it wings and such as a I felt the zergling in the sc2 concept art felt over saturated with gimmicky visuals. I tried to bring it back to the root of a zergling. A Cold hyperactive pretty Farking scary hunter...thing. Last edited by poehalcho on Sun Mar 10, 2013 7:23 pm, edited 1 time in total. jeez, your drawing skills got far better than I remember from a while ago. it sure looks like a sketch but it's pretty detailed and I like it. I'm still terrible at drawing humans. There's like no progress there at all. It seems I'm okay at these type alien things though. I think it might just be the way go about it. Looking good. Maybe you could make a big version of this and shade it up? A little creepy but pretty cool!.. xD But, why not add some color?